As a designer, I worry how well my clients understand the choices they are making and whether they will be happy with them once completed. Of the many decisions we make in a remodeling project, some of the hardest for people to imagine are size, shape, space, lighting and paint colors. Out of that set, selecting paint causes the most acute stress. Maybe that’s because it comes at the very end of the project when expectations are running high and everyone just wants the project finished. Clients often tell me they want to do “real color,” but are terrified about making the decision. We work with their furnishings, artwork, preferred palettes, family members’ preferences, room orientation, and available light to determine how to get the effect they want to live with. Then we paint – and wait. Eager to see how their new spaceis going to look, they return, often with friends. This is where Paint Traumatic Stress Syndrome typically sets in. One client was site impaired and since the general color was about as much as she could detect, she asked for real color. We chose a warm pink with brownish tones that set off all her blues and dark furniture. We talked about it, tried many shades, and finally settled on the one that was neither too light nor too dark. She was very nervous and very excited. 1) Think about the colors you most enjoy. This does not necessarily mean the space should be painted that color, but it may mean it could be painted a color that enhances your favorites. 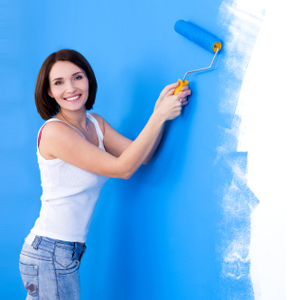 2) Choose paint in the room you are going to paint. Look at the samples in all of the room’s different light levels (i.e. sun, artificial) and on each wall. 3) Put the paint chip (get a big enough sample or several smaller samples) on the surface that you are going to see it on. Stand back and look at it. This will give you the best perception of the color. About the Author Peggy Fisher is the Design Director of Fisher Group, LLC. Her experience includes 24 years in kitchen design, 30 years in interior design, and 29 years in home remodeling. To reach her, please visit: http://www.www.designbuildrenovate.com. Article featured in I AM MODERN Magazine.